Built during the 1600’s, First Church in Cambridge is an Episcopal church that favors a traditional approach to worship. When the church underwent a major renovation in 2000, Shaun Crossen of Shanahan Sound & Electronics, found himself dealing with an issue that is common to the church market. "All too often there is no specific design team for the A/V and it gets dealt with almost as an afterthought. They were spending a lot of money renovating this historic building in Harvard Square and they knew they had to do it right. A number of attempts had been made to install a system with less than satisfactory results." Perry Neubauer, chairperson of the church building committee and an architect by profession, talked about the problem. 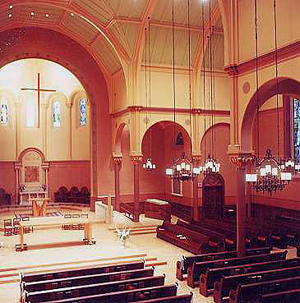 "The sanctuary is a big, cavernous space with a reverberation time of 1.5 to 2 seconds. The challenge was to make it possible to have speech and music well presented without affecting the visual or acoustical integrity of the room." According to Crossen, "When we came into the project we avoided the ‘bigger-better-faster’ approach. With a room built to carry music, the primary purpose of the sound system is to augment and focus the energy of the spoken word. The pastor needs to be heard. Big speaker boxes and a lot of power are not necessarily the answer." Shanahan Sound found a simple solution to the problem. They installed four JBL Control 25’s; one on each of the wrought-iron chandeliers that hang over the seating areas. These, powered by a Bogen GS150 mixer/amplifier, were integrated with the existing system and virtually disappear against the chandeliers. Shanahan also designed a remote-control system that allows the church to choose between three different system settings — Full, Semi-full and Regular — based on church attendance.